I have decided that maybe I should take a little break from 28 mm Napoleonics. I have play tested 4 different rulesets over the last couple of years and have painted up multiple units. My next planned major project will be Plancenoit and I will need to paint up 4-5 regiments of French Cavalry as well as some Horse artillery. The big job though will be the IV Prussian Korps which requires 18 infantry battalions, 12 cavalry regiments and 9 artillery batteries, it is enough to take my breath away, as I have really have none of this done. I also need to see how the plastic figure availability evolves, as this is a lot of figures. Time to take a little breather......need to do something different. I also want to learn how to use an airbrush. I thought seriously about doing Romans, Crusaders or the Japanese Waring States, all very tempting. Lots of great figures out there and some new nice rulesets. But I said to myself is that really different, and I said no it is not! I also wanted to try to paint some smaller figures and maybe something a little less complex. The thought of tanks excited me! 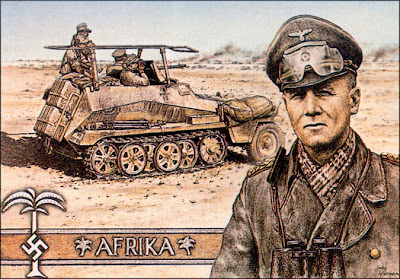 WWII seemed to fit the bill, I did quite a lot of research and have settled on 15 mm figures and the North African theatre, I always liked those 50's films about Rommel and the Desert Rats. In the last month, I have painted a few vehicles and some little men (I was shocked at how small 15 mm figures are), all of which I will chronicle in a new series of posts. So that brings me to a question, should I start a different blog which is devoted to my WWII adventures or should I blend the WWII posts into my Wargaming in 28mm blog. I have noticed some of you have used the Poll widget, so I said why not ask the readers. Very simple question, should I run one or two blogs, I would really appreciate your advice. Please see the Poll to the upper right. Many thanks for your responses. Personally I keep everything on one blog as it's easier to manage and for your followers to easily see everything your doing. It helps keeps the posting gaps to shorter periods as well for you blog. One blog of course.... you don't need change the title! I agree with all the comments above, keep it in one blog, Nuff said! Seeing your list I'm not surprised you're daunted! I've also recently branched into a smaller scale than 28mm and finding it a refreshing challenge. I'd say stick with one blog, easier to follow and most people have broad hobby interests I suspect. My own blog covers multiple areas, hopefully it isn't too much of a mish-mash. Seriously, though, it's probably easier to manage in one blog. Robert could probably tell you what running multiple blogs is like, I'm sure! Stick with the one blog. Can you use labels or something so that the different topic types could be selected? This is the first time I've come to your blog so I don't know what it's main focus is but personally, I have split mine into Ancients and basically everything else (everything from the Wars of the Roses onwards including all horse and muskets and even moderns!). I've found that I have very different followers on both blogs as people who like Ancients just like to read about ancients etc but people in terested in guns like guns from all periods haha. But probably, I'd just keep the one blog! It's much easier! I'd suggest sticking with one blog, but whatever makes sense to you is likely the right answer. The rest of us will follow along whichever way you go. 15mm WW2? That was my first foray into historicals after following my son into the 40k world. While it get's bashed by the rivet counters, I like Flames of War for 15mm WW2, it's well supported and players abound. You can always substitute the Battlefront mini's for less expensive ones like the new plastics from "The Plastic Soldier Company"
Agree with most of the others - use the same blog. I've mixed it up quite a bit on mine and found it quite refreshing - you don't get bogged down in Napoloenics or whatever era you're obsessed with at the time. While I quite admire the FoW 15mm treatment of WWII, it is a bit hard and fast with historical reality in some aspects AND if you wish to do it justice, can be expensive to collect (although no more than Perrys or Foundry I guess). I discovered 28mm WWII and 'Disposable Heroes' rules which also have quite a following in the US. Thats using 1/48th scale models for armour etc, which I have found both challenging but also very rewarding to make and paint. Fantastic eye-candy on the table too! At the end of the day, do what excites and interests YOU the most! I'm debating the issue myself; my blog will be predominantly Napoleonics for at least several years to come, but I also have a fair amount of Renaissance/Italian Wars, Late Medieval, and even ancients stuff, and I sort of feel it belongs in a different place,ewspecially with the very Napoleonic title of my opwn primary blog. Actually I like creating the period "atmosphere" that having a separate blog for each period allows, but then I enjoy the graphic work which is kind of a hobby in itself. Guess I'm just a Blog Whore. Certainly though, having it all on one blog is certainly easier, especially seeing as it is just the two periods you have going. And in the end it's as Doc says, just do it the way you want to do it.